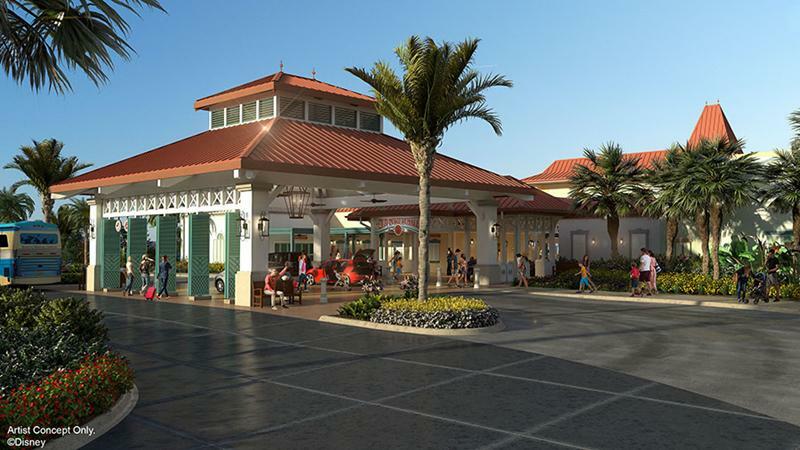 Disney will be making daily announcements about its new and upcoming parks and resorts projects beginning December 5th. Part of the first ever 12 Days of Disney Parks Christmas, details will be announced daily from December 5 through to December 16, 2017. Disney will be giving away a special holiday magnet to Annual Passholders at Disney’s Hollywood Studios. Beginning December 17 2017, breakfast hours for the Bon Voyage Breakfast at Trattoria al Forno are being extended. The character dining experience that includes Rapunzel, Flynn Rider, Ariel and Prince Eric will be available from 7:30 AM to 12:00 PM. Bon Voyage Breakfast at Trattoria al Forno costs $34 for adults, and $20 for children, and is 1 credit on the Disney Dining Plan. Disney has given us some more details regarding the backstories on the three new restaurants and one new bar coming to Disney Springs in the next month. The building, which originally served as the power plant for the growing town of Disney Springs, showcases remnants from its past life: keep an eye out for the Boiler Bar, with its electrical display panels, and the adjacent boilers, which are still classic centerpieces of any power plant. 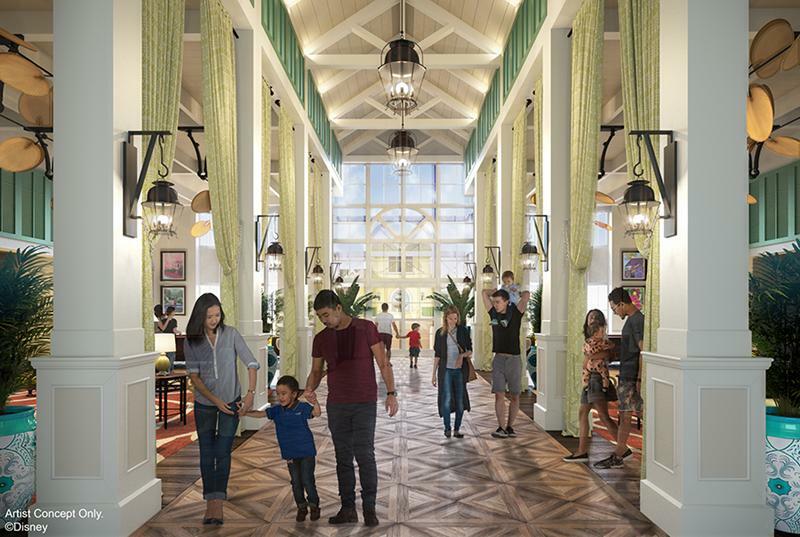 The décor includes a one-of-a-kind mural romanticizing the golden age of innovation and a larger-than-life, working clock tower that greets guests upon arrival. 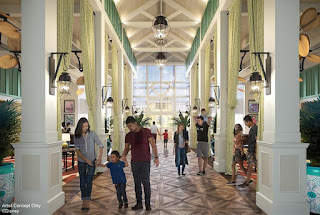 By day, The Edison will welcome families, in the early evening, everyone is invited to dine, but as night sets in (around 10:00 p.m.), the location transforms to an adults-only scene for guests ages 21 and up, with a groundbreaking beverage menu, dining and entertainment unlike anything else at Disney Springs. Steps away, the unexpected Enzo’s Hideaway offers a glimpse into another lounge – this one, a secret space that first served as a bootlegger’s hideout. A legendary speakeasy that was discovered by Enzo after he purchased the terminal, this network of tunnels was the center of the Springs’ social life during the “dry years” of prohibition. The Big Blue pool will be closed January 16 through January 19, 2018. Flippin' Fins pool will be closed January 31 through February 2, 2018. Samawati Springs pool at Kidani Village will be closed January 8 through January 19, 2018. Beach Pool closed for refurbishment November 20 through February 25, 2018. The Meadows pool will be closed January 30 through February 2, 2018. 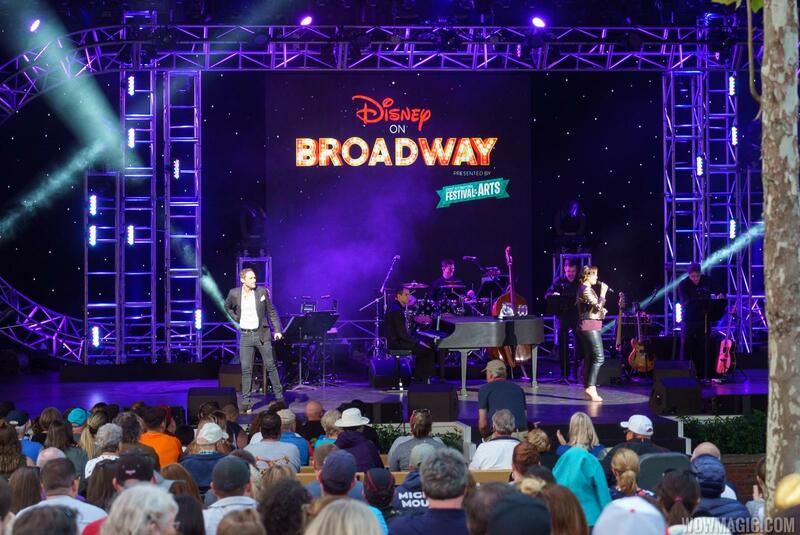 The performer line-up for the 2018 Epcot International Festival of the Arts - Disney on Broadway Series has been announced. 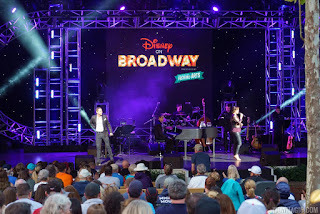 Taking place on Fridays through Mondays at America Gardens Theatre, with showtimes at 5:30pm, 6:45pm and 8:00pm, Disney on Broadway Series is included with theme park admission. Dining packages with reserved seating are also available. 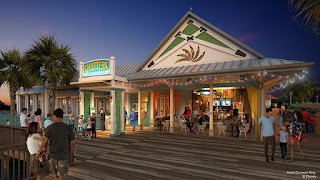 Disney has revealed details on the changes coming to Disney's Caribbean Beach Resort. 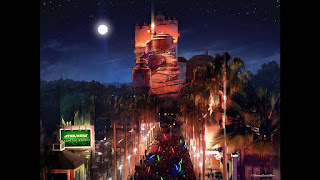 Star Wars: Galactic Nights returns to Disney's Hollywood Studios on December 16, 2017, and we have a look at the provisional entertainment schedule, attractions and meet and greet line-up. The party takes place from 7pm through to midnight, although guests will be able to enter with their ticket from 5pm. 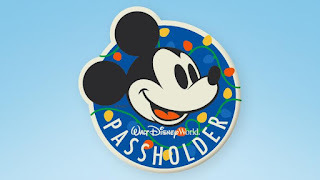 Tickets are priced at $129 adults, $124 ages 3-9 (discounts available for Annual Passholders & DVC Members). Purchase Star Wars: Galactic Nights tickets here or call 407-W-DISNEY (407 934-7639). Imagineering; Chris Beatty, Executive Creative Director at Walt Disney Imagineering; Doug Chiang, VP/Creative Director at Lucasfilm. They’ll take you around the galaxy and inside the making of Star Wars: Galaxy’s Edge, the 14-acre expansion scheduled to open in 2019 at Disneyland Park and Disney's Hollywood Studios. During this fascinating sneak peek, find out what it’s like to bring the epic saga to life—from the big screen to the real world! You’ll learn about the design, development and progress of Star Wars: Galaxy’s Edge as the Imagineers reveal how they’re creating real-life versions of all the iconic things that make Star Wars so spectacular. Star Wars: Galactic Destinations - Projections on Sunset Blvd - 7pm to midnight. Watch as the Hollywood Tower Hotel is transformed with state-of-the-art projections, special effects and lighting to depict spectacular destinations from across the Star Wars galaxy. The stellar Star Wars cinematic score adds to this awe-inspiring experience. Jedi Training (ages 4 to 12) - Star Tours area - 6:10pm, 6:40pm, 7:15pm, 7:45pm, 8:15pm, 8:45pm, 9:45pm, 10:15pm. DJ Dance Party - Centerstage - 7pm to midnight. Star Wars: A Galaxy Far, Far Away - Centerstage - 7:30pm, 8:30pm, 9:30pm, 10:20pm. 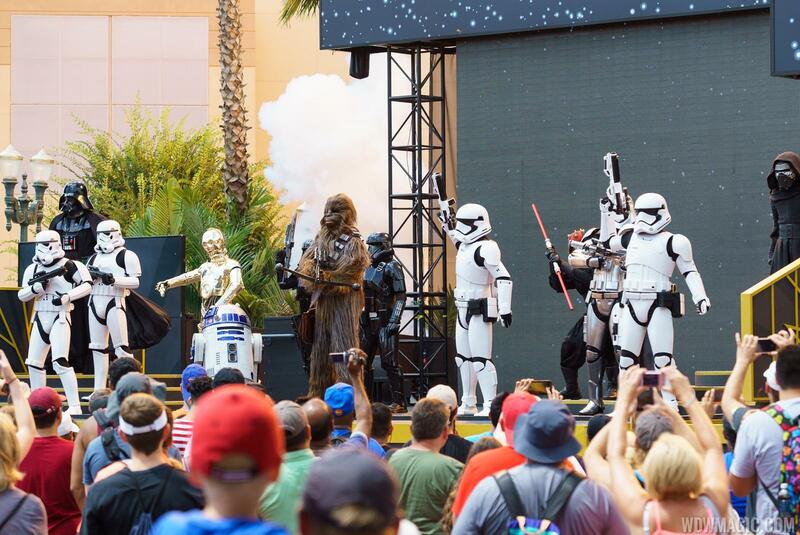 Imperial March - Main entrance to Centerstage - 7:05pm, 8:05pm, 9:05pm, 9:55pm. Galactic Nights Epilogue - Centerstage - 11:40pm. Star Wars: A Galactic Spectacular fireworks - Centerstage - 11:45pm. Launch Bay - Darth Vader, Chewbacca, Kylo Ren, BB-8, Jawas and Rey. Each location will feature a special Snapchat filter, exclusive to the event. Take advantage of special event pricing on Memory Maker One Day, available for this event for just $39! With Memory Maker One Day, you’ll receive unlimited digital downloads of your Disney PhotoPass Photos from Star Wars: Galactic Nights—capturing your encounters with Characters, icons, attractions and more. Memory Maker One Day special event price ($39) is only available at Disney’s Hollywood Studios at Sid Cahuenga’s One-of-a-Kind, Rock Around the Shop and Tower Hotel Gifts during the Star Wars: Galactic Nights event on December 16, 2017. Special event price is not available via the My Disney Experience app. A Galactic Tasting Sampler is available for $30 and Jedi Recruitment package for $149.95. Along the Sunset Boulevard area of the park you will find Senses Spa offering three different makeover packages that include Star Wars-inspired nails, makeup and hair transformations. Makeovers take 30-60 minutes (depending on the package) and range in price from $50-90 for children and $80-120 for adults.